Launching a web store is often a headache for inexperienced users, who have never been aware of web design nuances yet face a necessity to get an eCommerce website. In most cases, they have two ways out – to hire a web designer (which is quite expensive for a beginner) or use a credible DIY website builder to independently create a project. Volusion and Shopify are ruling the roost, when it comes to DIY eCommerce website creation. Volusion – is the all-in-one eCommerce website builder, which works great for entrepreneurs aiming at successful business development. The service offers a wide range of of eCommerce features and tools that contribute to effective business development and promotion, increase of customer base and profit generation. 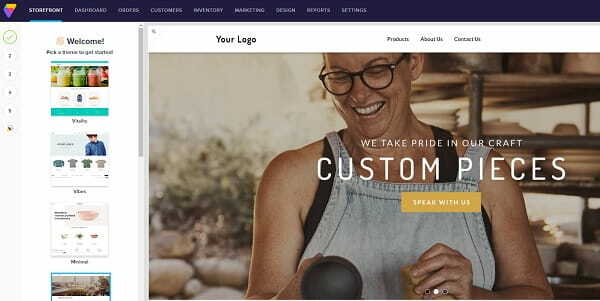 Shopify – is currently the most renowned eCommerce software, which has distinguished itself due to the powerful feature set, exclusive high quality templates, multiple design customization tools and extensive marketing options for multichannel selling. Both platforms offer an out-of-the-box shopping platform chock-full of advanced eCommerce features, hundreds of beautiful themes geared towards e-retailing, as well as mobile commerce solutions. At first glance, their offerings have a lot in common, but there are also many potentially crucial differences. 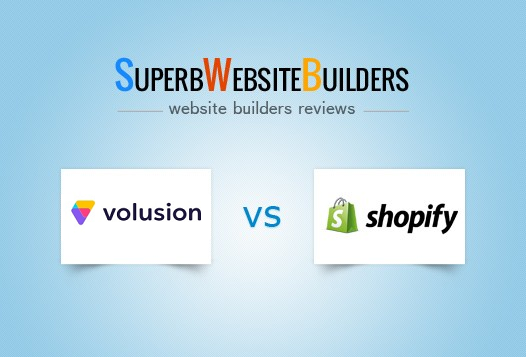 Join us exploring them in our updated Shopify vs Volusion comparison. Volusion. The website builder is quite convenient and easy-to-use both for newbies and web design pros. The system ensures intuitive process of website development. Right after you sign up for the service, you get access to the informative dashboard everyone can master in quite a short period. At the same time, the dashboard is a bit oversaturated with data, tools and sections you have to explore prior to working with the service. This may be a bonus for proficient web developers, while inexperienced users may find it challenging to master the system. As to the system editor, it is quite simple as well. Whatever editing tools and options you might need, you will find them here right from the start. By using them, you can add and manage website pages, edit and update your project, work with the product catalogue etc. 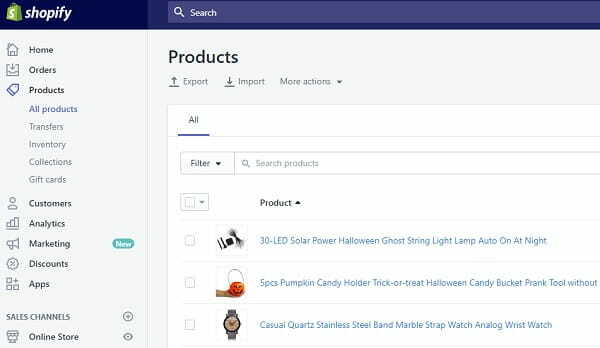 What’s important, the system has a convenient online store builder, which makes it possible to add and manage product categories, subcategories, images etc. Shopify. The software features exceptional ease of use and convenience, irrespective of the powerful feature set it provides. The dashboard of the system is intuitive and understandable to everyone, no matter what web design experience and skills you have. It’s just impossible to make something wrong here – so detailed and clear the system is. Having signed up for the platform, you’ll be offered a detailed guide on how to use the system to the advantage. By using the tutorial, you’ll easily cope with all the stages and challenges of the web store development process. When working in the dashboard, you will be able to set up all the web store settings, SEO parameters and web design options. This is where you can reach Shopify Storefront Editor to give you online store the desired look and performance. To simplify the web design process, the screen will be divided into two parts: the one, where you will make the edits and the one, where the changes are displayed. This is a smart approach that lets you control the web development process. Finally, Shopify offers an opportunity to upload and use Android and iOS apps at no cost at all. This matters a lot for entrepreneurs, who are always busy and will find it convenient to manage and update their online stores even on the go. The changes made via mobile devices are automatically synchronized with Shopify POS and online store at a time. Volusion vs Shopify. Volusion somewhat lags behind Shopify in terms of usability. Even though, both systems offer convenient system navigation, user-friendly dashboards and intuitive interfaces, Shopify is still much easier to explore and use for people with no web design background. Volusion. The system grants access to powerful eCommerce tools that contribute to the speed and efficacy of web store creation. These include CSV file import/export option, barcode generator, specialized inventory management system etc. The platform also allows using niche-specific features to help you manage a web store to the advantage. The most useful of them are the tools needed to calculate shipping rates and taxes, integrate drop shipping feature, set up shipping parameters etc. Volusion also offers a set of conversion boosters that enhance the shopping experience of clients and affect the amount of sales. Some of the boosters the system can boast are: client reviews available at website pages, advanced search filter option, homepage slideshow integration, convertible product pages, product display customization, related product offers etc. What’s more, the system provides a powerful set of marketing instruments that contribute to the effective product promotion and sales generation. Some of them are: an opportunity of domain connection, powerful SEO functionality, website logo and favicon upload, advanced social media management options, gift certificates, email marketing and what not. Shopify. The platform offers an advanced feature set that makes it possible to launch small, medium and large eCommerce projects of any specialization and complexity level. The advanced Point-of-Sale (POS) feature makes it possible to sell products not only online, but also in local retail storefronts. You will be able to create protected multiple staff accounts to share web store management rights, use external card terminals, accept orders both in online and offline modes. Shopify makes it possible to create unlimited product lists with detailed reviews and high end images. The Augmented Reality tool contributes to the detailed visualization of products offered for sale, making it possible to view their detailed characteristics and parameters from different angles. By integrating your Shopify account with those of other external services, you can notably boost your website performance and grow customer base as well as sales volume. For example, synchronization with Amazon Marketplace account will help increase the percentage of targeted audience. The same concerns integration with Quickbooks, Xero and other well-known platforms. To protect Shopify online stores from unauthorized access of third party users, it is possible to apply the new Fraud Protection tool Shopify has recently introduced, Tag and Chip Reader that can be synchronized with Shopify POS, SSL Connection option etc. Volusion vs Shopify. Shopify is a distinct leader in terms of a feature set. The eCommerce software is full-packed with powerful business and marketing options, design customization tools and customer engagement solutions. The system pays special attention to security measures and offers integrated mobile applications for effective 24/7 online store management. Volusion. The eCommerce builder currently offers 40 templates, which are both free and paid. The number of free themes constitutes 13 templates, while that of paid designs is 27. The cost of the paid themes ranges between $50 and $180 based on the complexity of the template, depth of customization required and other notable parameters. The templates are responsive by default, but they don’t have high end look. Developed by Volusion designers, the templates are not quite easy to customize for an ordinary user. You’ll get access to multiple design customization tools, but it takes time to make all the required edits. By the way, each Volusion template has multiple menu layouts, Content Builder and over 150 variations of the drag-and-drop editor. This allows creating hundreds of layout formats, which also implies time and effort investment. To give the templates unique look, you can use advanced HTML/CSS skills, watching the progress in action in the WYSIWYG website editor. In case you are not satisfied with the selected theme, you can switch to another one on any stage of the web design process. Fortunately, Volusion allows doing that without content loss. Shopify. As compared to Volusion, Shopify has a more extensive template collection. There are currently 10 free and 51 paid designs here, the quality of which is on the top notch level. All the templates are professionally developed with ease of design customization in mind. The cost of the paid themes ranges between $140 and $180, which also depends upon their multiple parameters. To simplify users’ search and minimize the amount of time needed to select a theme, they are grouped into categories based on the topic they belong to. Apart from standard design customization options, Shopify makes it possible to edit templates by using a Liquid markup language. It ensures perfect and engaging web design experience and provides access to numerous technical tips, Liquid language resources, how-to guides etc. Apart from that, it is possible to use HTML/CSS programming knowledge to make the selected template unique and visually-appealing. Volusion vs Shopify. When it comes to the design aspect, Shopify is a winner here as well. Its themes look modern and their overall number is almost 3 times larger than that of Volusion. Besides, Shopify has a big amount of free templates that allow users with a small budget create professionally-looking online shops. It also offers integrated Liquid tool and extensive design customization options to create unique impressive designs. Volusion. Volusion offers decent customer support. The system provides an informative knowledge base, which encompasses video tutorials, FAQs materials, how-to recommendations, an eCommerce blog etc. There are also webinars here, providing detailed information on all the system-related inquiries. Live communication is also available here. If you need personal assistance or have specific questions concerning the use of the system, you can get in touch with a Volusion expert via live chat, email or telephone. Tech support is accessible round-the-clock to ensure stunning non-interrupted performance of your online store. Shopify. Quality customer support is what Shopify is known for. The system has an impressive forum that comes with tons of informative articles, tutorials, tips, recommendations, how-to guides and other related materials. It also makes it possible to view video tutorials on the independent Shopify YouTube channel. Users can get in touch with Shopify Guru in the Live Chat or via email correspondence to have their problems solved. Shopify vs Volusion. Shopify ranks higher than Volusion in terms of customer support. The system offers an extensive knowledge base comprising detailed tutorials, how-to guides, FAQs, tips and recommendations. There is a forum for online and offline communication, YouTube channel and live chat help provided by Shopify Guru. Volusion. The website builder offers four plans that can fit any budget needs. These include Mini, Plus, Pro and Premium subscriptions. The cheapest plan costs $29/mo, while the price of the most expensive plan constitutes $299/mo. Subscriptions may be billed annually and monthly. When buying annual plans, users may save a lot. Volusion doesn’t charge any extra fees for money transactions made in the system. ✔ Deal of the Day & Customer Loyalty Plan. Shopify. The eCommerce software lets you explore the system features during 14 days with no fees at all. Having checked out the available options and tools, you can decide to upgrade to one of the paid subscriptions. There are four of them here – Light, Basic Shopify, Shopify and Advanced Shopify. The price range is quite impressive and constitutes $9/mo – $299/mo. The feature set implied by each plan affects the cost of the plans in the long run. Shopify offers the money back policy during 14 days after purchasing the subscription. It’s worth mentioning that the system has commission fees for the transactions made in it. The percentage of commissions constitutes 0.5%-2%, being reduced on more expensive plans. Volusion vs Shopify. The pricing policy of both services is almost identical. The plans are not quite cheap, but they are worth the investment. Shopify, however, offers more extensive eCommerce options, which cannot even be compared to those provided by Volusion. Whatever project you are going to develop, you’ll certainly find a plan to cover your needs here. If you are right about to set up a powerful and quality eCommerce website, both Shopify and Volusion will work well for this purpose. The systems are easy-to-use, convenient and understandable. Volusion is the eCommerce website builder, which offers extensive design customization services and tools. It practices reasonable approach to the process of web store development, yet it requires a certain degree of web design awareness. Shopify is the advanced and powerful eCommerce software, the major niche specialization of which goes down to the development of online stores. The system offers deep website customization options, high quality templates and abundance of eCommerce features. Verdict: if you have long-term goals, need an eCommerce website to establish reliable web presence for you business and intend to choose the system featuring price/quality correlation, then Shopify is undoubtedly a more preferable solution you won’t regret.